KRK ROKIT 6 G3; the third generation of KRK’s celebrated active studio monitors – seen here in sleek black, ready to fit into any studio..
KRK ROKIT 6 G3; the third generation of KRK’s celebrated active studio monitors – seen here in sleek black, ready to fit into any studio set up. Offering high quality audio with a lot of volume, it is clear why the KRK Rokit powered studio monitors are so popular in home studios around the world. Where desk space is a premium, the option to have this level of audio fidelity in such a small enclosure is what makes the Rokit Powered series perfect speakers for home studios. The KRK Rokit Powered monitor offers incredible sound via a 1” soft dome tweeter and a 6” glass-Aramid composite woofer. The results are extended bass response, amazing vocal clarity and high frequency output up to 35kHz, allowing you to carefully monitor all facets of your current project. Radiused edges reduce distortion of the sound due to diffraction while the enclosure has been designed to ensure low-resonance meaning distortion and colourisation of the sound is significantly reduced. A ROKIT waveguide is used which is designed to ensure incredibly detailed image when in the listening position while a front-firing bass port reduces boundary coupling, thus allowing more options for positioning the Rokit RP6 in the room. A wide range of input connections mean the ROKIK 6 G3 easily integrates with your existing system setup while a proprietary bi-amped, class A/B amplifier delivers SPL up to 107dB, a lot of head room and low distortion. The KRK ROKIT 6 G3, Rokit Powered studio monitor is the perfect, compact solution for small studios requiring big sound. New KRK Rokit Generation 3 Monitors In Stock! 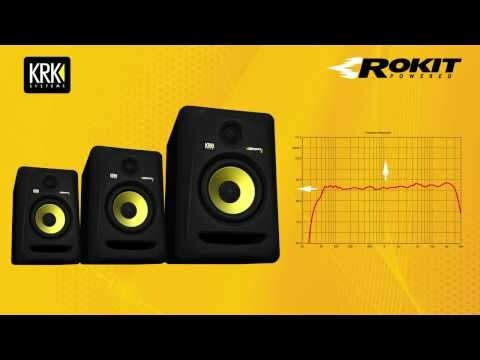 KRK Launch 3rd Generation Rokit Studio Monitors! Look very cool and sound great! Bass is well defined, deep and as recorded. Drums sound brilliant too! Give a very pleasing sound even at low levels!